Players will have to wait a little longer to dust off their copies of Halo: Reach and Call of Duty: Black Ops for Xbox 360. You won’t find much Halo among the first Xbox 360 games that will work on the Xbox One, but Microsoft says it’s working to change that. On November 12, Microsoft will launch its long-awaited Xbox One interface overhaul, which will also bring backwards compatibility with some Xbox 360 games. The first wave includes 104 titles (full list below), and Microsoft aims to add more on a regular basis. Gears of War fans should be happy to see compatibility for the entire series. Other big hits on the list include Assassin’s Creed II, Mass Effect, Fable II, Borderlands, and Fallout 3. Much of the list, however, comprises smaller indie games and 90s-era re-releases. The only Halo game at present is Halo: Spartan Assault, a top-down shooter that Microsoft ported over from mobile devices. More games are coming in December, including Halo Reach, Halo Wars, Call of Duty: Black Ops, Skate 3, and the entire Bioshock series. Microsoft says it will eventually have a “long list” of compatible games, and any free games the company offers through its Games With Gold program will be backward compatible as well. Backwards compatibility works with both retail discs and downloads, and any cloud saves through Xbox Live will transfer to the new console. Xbox One features such as game DVR, broadcasting on Twitch, and console-to-PC streaming will all work with Xbox 360 titles. Multiplayer should also remain intact for as long as publishers keep their servers up and running. Why this matters: All evidence points to Microsoft falling far behind Sony in the console wars, with some estimates showing PlayStation 4 sales nearly doubling the Xbox One worldwide. 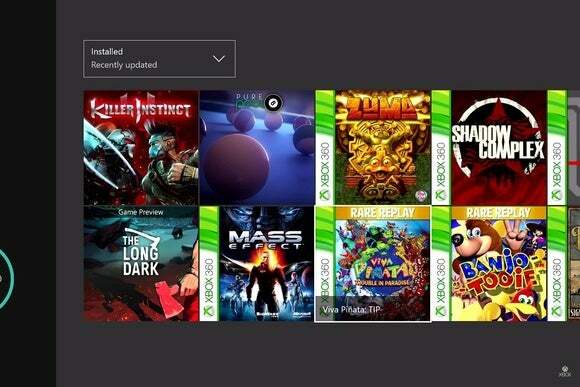 Backwards compatibility could help Microsoft regain some ground among people who haven’t upgraded, and might not want to lose access to a decade’s worth of games.